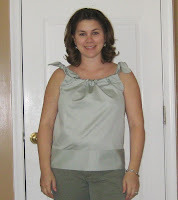 Here's my first garment created by using a big-girl sewing pattern! 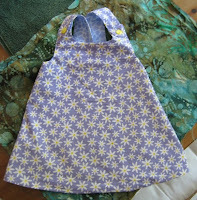 It's a reversible pinafore, depending on if Olivia and I are feeling daisy-y or giraffe-y. I made my own pattern for the next one, the goal being to make it from two fat quarters and some muslin. I also wanted it to be a solid A-line piece on the front and back, and not a complicated design with lots of pieces. Can't wait until Livi can sit up! This one is a top made from a pillowcase (440 thread count, baby). I made a skirt first, took about 10 minutes: cut the end off, fold over and sew to make a channel, add elastic. Then I used the other pillowcase in the pack to make the top: cut the end and armholes, sew channels at the top, make strips from leftover fabric, run those through the channels, and tie. will call u this week.